Los Angeles police say investigators have found a baseball bat and bolt cutters they believe a homeless man used to attack men sleeping on streets or beaches, killing three and leaving others in comas. 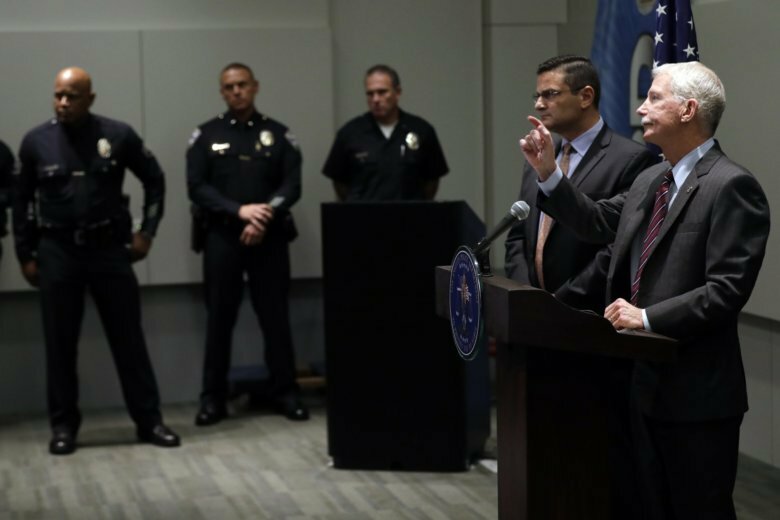 At a news conference Wednesday afternoon, authorities said they will ask prosecutors on Thursday to charge 47-year-old Ramon Escobar with murder and attempted murder in a series of attacks this month in L.A. and Santa Monica. Escobar is being held without bail following his arrest in connection with a Monday attack in Santa Monica. Authorities believe Escobar also bludgeoned three men sleeping on the beach or under the pier in Santa Monica and three men sleeping on the street in downtown Los Angeles. Police believe robbery was the motive. Police say the attacks took place less than two weeks after Escobar drove to California from Texas, where he is a person of interest in the disappearance of his aunt and uncle. A man under investigation in brutal beatings of Southern California homeless men and the disappearances of relatives in Texas has a criminal record that includes assault. Records in Texas show 47-year-old Ramon Escobar has had arrests for vehicle burglary, trespass, failure to stop, public intoxication and two assaults, most recently in November 2017. That case was described as a misdemeanor. Escobar was arrested Monday in the Los Angeles suburb of Santa Monica for allegedly beating a homeless man into unconsciousness. Los Angeles police say he’s a suspect in a recent attack on three homeless men, including two who subsequently died. Houston police say Escobar is a person of interest in the disappearances of an aunt and uncle last month. A man arrested on suspicion of beating a Southern California homeless man into unconsciousness and suspected in three fatal beatings is also being investigated in the disappearance of two Texas relatives. Houston police Lt. Humberto Lopez tells the Los Angeles Times that 47-year-old Ramon Escobar is a person of interest in the disappearances last month of 60-year-old Dina Escobar and her brother, 65-year-old Rogelio Escobar. Dina Escobar’s burned van was found in Galveston a few days after she went looking for her missing brother. Lopez says Ramon Escobar is their nephew and police want to talk to him. The Southern California beatings occurred in Los Angeles and suburban Santa Monica, where Ramon Escobar was arrested Monday after a homeless man was severely beaten.